Invokes the provision of the Restatement that stipulates that the provisions of the Declaration should be read with the intent of the entire document. When the language in the covenant is clear no further review of surrounding circumstances is required. This case allowed a majority of land owners to revise the declaration without compliance with the membership requirement of the bylaws. The association had no authority to provide voting requirement in the bylaws that contradicted the clear language of the declaration. Specific statutes have precedent over general statutes if they conflict. Similar statutes should be construed together even if they do not reference each other. This is the prime argument why the definition of meeting in the public body open meeting laws also applies to the open meeting laws for Common interest communities, as presented in AG opinion I97-012 above. This is specifically why the use of e-mails by a quorum board members in common interest communities is a violation of the open meeting laws. See HB 2065 from 2018. For fines to be reasonable they must be published and distributed and based on a schedule that is commensurate to the significance of the violation. Attorney fees cannot be awarded for hearing before an Administrative law judge. Decisions from an ALJ can only be enforced via contempt of court heard in Superior Court. Bylaws do not satisfy Covenants on the land, and cannot add or alter restrictions on the use of the land. 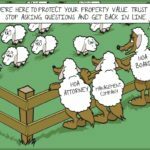 Without specific authority granted in the Declaration the associations do not have the power to adopt rules other than those to protect the common property that restrict the use occupancy of, or behavior within individually owned lots or units. Business judgement rule does not apply to HOA’s the duties stated in the Restatement do. The discretionary powers of the association must be reasonable. State statutes supersede provisions in CC&R’s. Constitutional challenge to the state statute as an impairment of contract. Associations have a duty to protect the homeowners from predictable risk. Associations have a duty to enforce the community documents. Material changes to CC&R’s in an amendment required unanimous consent of members. Conversion of a non-mandatory association to a mandatory association. When the prior case (Dreamland v. Rainey) determined that an amendment to the CC&Rs was invalid the association owed all homeowners in the community restitution for all charges paid based on that amendment. Reasonableness standard applied to rules and regulations of an association. Statute of repose for association absent specified statutory limits should utilize the 4 year for challenges of amendments to declarations. Public policy relative to group homes supersedes restrictive covenants. Covenants should be read to understand the intent of the restrictions. McNally v. Sun Lakes Homeowners Assoc. Illegal barring of board directors in meetings of the board. A board directors duly elected or appointed retails all rights and privileges until he resigns or is removed. Implied requirement associated with declarations or plats are as valid as specified requirements or restrictions. Even if the declaration allows for the direct application of attorney fee, they can be overturned if they are unreasonable. Non-waiver clauses do not constitute selective enforcement is the association invokes the concepts of fairness and reasonableness in applying its discretional enforcement powers. Established that the initial HOA dispute resolution process enacted in 2006 was unconstitutional based on separation of powers. Process ended in 2010 but was reinstated in 2011 by enation of SB 1142. Transferred to the Department of Real Estate in 2016. Depublished by the Arizona Supreme Court. Established the criteria for determining the constitutionality of statutes applying judicial power to administrative agencies. Foreclosure action on an HOA assessment lien constitutes debt collection under the Fair Debt Collection Practices Act, and post judgement attorney fees cannot be added absent specific authorization by a Judge.